Did you know Americans throw out 25% more waste during the holidays? Think of all the packaging, gift wrap, food and more that end up in our waste bins. 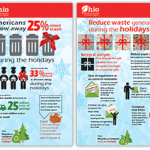 The Ohio EPA has some great infographics and tips on how to reduce waste during the holiday season. See them below, or visit their site for more good ideas. 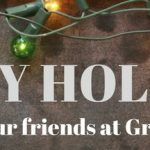 This entry was posted in All, Events and tagged holiday waste. Bookmark the permalink.